Several Fairgrieve Elementary students received accolades during a recent Morning Express program at the school because they exceeded classroom expectations throughout the month of October. 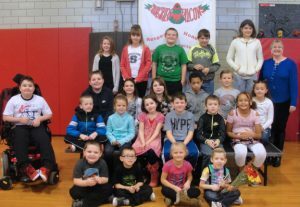 Expectation honors and “brag tags” were presented by Principal Jean Sampsell to the following students: in the front row, from left: Evan Mears, Carter Anderson, Tamara Martiny and Ayden Bronchetti. In the second row, from left, are: Brian Santiago, Travis LaClaire, Aubree Gleason, Lilyana Loftus, Maddox Collins, Henry Taylor and Ra’mya Martin. In the third row, from left, are: Brayden Wise, Paighton Whitney, Alyssa Hatter, Elijah Brooks, Clayton Demars and Adrianna Viscome-Rice. In back, from left, are: Trista Sullivan, Kenadie Shatraw, Anthony Carroll, Hayden Lockwood, Alexis Myers and Principal Sampsell. Absent are Rylie Munger and James Regan.